To my surprise, I got called for an interview, which was held in the medieval city of Kilkenny, where the course is based. As I had an early morning slot, I decided to drive down the day before and stay overnight in Kilkenny. When I arrived, I wandered around the city, taking in its ancient buildings and thinking about the next day’s interview. My brain was busy trying to cobble together cogent answers to likely interview questions when a woman selling bunches of heather stopped me and offered to read my palm. I had never had my fortune told and I was and still am ambivalent about the process. However, there was something compelling about her and I was curious, so I caved in and proffered my palm. Most of what she said was vague but one thing struck a chord, the gist of which was, I had nice clothes in my closet, which I didn’t wear and her advice was ‘wear your clothes’. It was certainly true I was in the habit of keeping a deal of my clothes for ‘best’. After this encounter I did start to wear more of my clothes on a daily basis, rather than saving them for some far off elusive special occasion that might never happen. 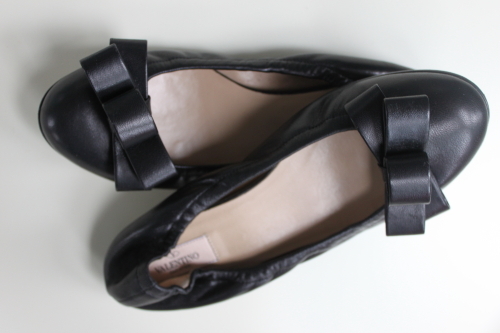 I though of that encounter last week when I looked at the pair of ballet flats, bedecked with bows which I bought back in January, a bargain as an outlet shop slashed prices, in the last days of the sales and have only worn once since then. I may be suffering from the ‘too good to wear syndrome’ again; time once more I think to heed the fortuitous words of the fortune-teller. I didn’t get a place on the course and I never took the jewellery making any further but I do still occasionally wear some of the pieces I made at those evening classes, I went to a several years ago. However the real moral of this story is that apt advice sartorial or otherwise can come from the strangest of sources. working out, the shoes are fab. Well wear. C.